To see where an stakeholder is positioning, use the scale from 1 to 10 and make this graphic. High power, interested people: Manage Closely - these are the people you must fully engage with, and make the greatest efforts to satisfy. Most critical stakeholder group: collaborate with closely. High power, less interested people: Keep Satisfied - put enough work in with these people to keep them satisfied, but not so much that they become bored with your message. Useful for decision and opinion formulation, brokering: mitigate impacts. Low power, interested people: Keep Informed – keep these people adequately informed, and talk to them to ensure that no major issues are arising. These people can often be very helpful with the detail of your project. Important stakeholder group, in need of empowerment: involve, build capacity and secure interests. Low power, less interested people: Monitor (minimal effort) - again, monitor these people, but do not bore them with excessive communication. 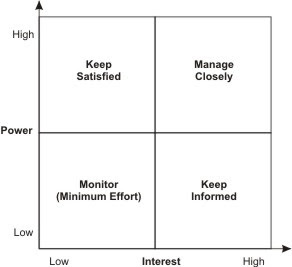 Least priority stakeholder group: monitor or ignore.